Like America’s early settlers, content marketers need to adapt to their new, challenge-filled surroundings. From information overload to the death of organic social reach to age-old challenges such as the lack of time, budget, and internal resources, consistently creating new quality, engaging, and inspiring content is an ever-present challenge. The good news? You likely already have a lot of the ingredients you need to create a tasty, strategic content cobbler. And the baking tactic is repurposing those ingredients into something your audience can’t resist. Ingredient #1 – Your pantry of existing content. If there’s one thing that every content marketer has in spades, it’s a fully stocked content pantry. From white papers and eBooks to blog posts and original or third-party research, all of that robust and niche content has the potential to be sliced, diced, and repurposed into something new and fresh. 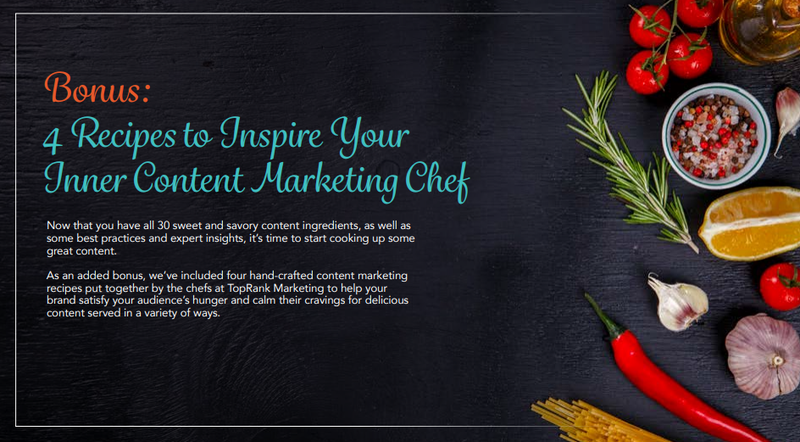 For TopRank Marketing’s CEO Lee Odden, microcontent is one tasty repurposing ingredient. And I have a very fitting example of both microcontent and more robust content pieces being repurposed into a tasty dish: the Mastering the Perfect Content Marketing Recipe: 30 Essential Savory & Sweet Content Ingredients eBook. In our quest to be the best answer for our audience, the TopRank Marketing team had created individual, robust blog posts on 30 unique content marketing tactics, all featuring definitions, quotes, examples, and best practices. And as an integrated digital marketing agency, we wanted to bring all of those tactics together under one roof to give our audience a little strategic food for thought. We plucked and tweaked the best practices content from each of the blog posts to form the meat of the asset. Then we seasoned it with microcontent—namely original and curated quotes from internal and external experts—to add additional insight and authority. Finally, we topped it off with some new, original content to add a little extra flavor. Ingredient #2 – Your spice cabinet of flavorful data and insights. Herbs and spices often hold the key to unlocking the full potential of any dish or desert—and any good cook has the essentials on hand. So, when it comes to making sure your repurposed content cobbler tastes just right for your audience, it needs to be seasoned with the right data and insight. Dig into the data to draw insight on what is resonating most with your audience—as well as what’s leaving a bad taste in their mouth. Then take action on those insights as you repurpose to help improve reach, engagement, completed calls to action, and more. Ingredient #3 – A drizzle of creativity and experimentation. Cobbler was born thanks to the creativity of America’s early settlers. And the truth is, marketers, we all have unique creative insights that can be added to the repurposed content cobbler mix to create something different and relevant for our target audiences. We often feel like we don’t have the tools, technology, the team, or the talent to be highly creative. But we marketers are scrappy in the content kitchen. We’re innovative. We can and have made the absolute most out of whatever resources we’re given. But the key to success here isn’t luck. You have to tinker. You have to experiment. You have to practice. This will not only help you refine your recipe, but also find opportunities to use your resources in new ways. Like early settlers, content marketers need to adapt and innovate in the ever-changing marketing landscape using the resources they have to consistently create quality, engaging, inspiring content. So, it’s time to get to the kitchen, throw open your content pantry, data and insight spice cupboard, and add a dash of creativity and experimentation to find unique ways to repurpose content that resonates and drives value. To get the creative juices flowing, check out our Mastering the Perfect Content Marketing Recipe: 30 Essential Savory & Sweet Content Ingredients eBook mentioned above to beef up your content marketing strategy and inspire your own recipe for repurposed content cobbler. 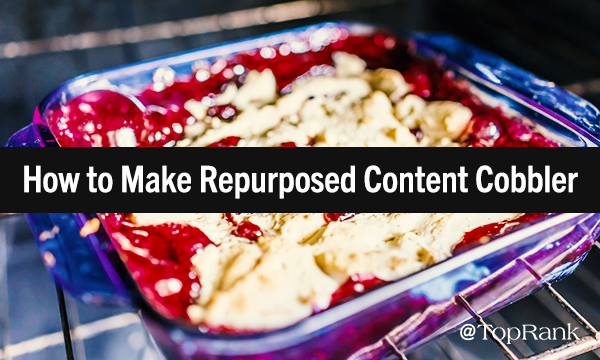 The post A Tasty, Strategic Addition to the Content Marketing Table: ‘Repurposed Content Cobbler’ appeared first on Online Marketing Blog – TopRank®.